Just the best people to work with! We look forward to our annual stays and count the days to our return. We absolutely love crystal lake. 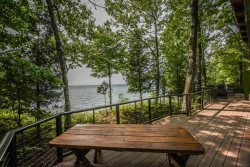 The cottage is only a short walk to the water and feels very private even though it is very close to neighbors. The place was spacious and very clean upon our arrival. Lots of updates. Would stay again. Danielle and other members of your team have always been friendly and helpful. Every time I called with a question they were friendly and helpful. Last year was our first year for renting a place and we were totally unfamiliar with what to do. It was all so easy that I figured I didn't understand something crucial to do! CVR people were wonderful. This year, our second, it was like we were old friends coming back to the same place. It was all easy and pleasant. We can't wait for next year! It was a wonderful week with our family. Being pet friendly meant we were all together too with no "boarding guilt" to deal with. The CVR people and the cottage owners made our stay a glorious family time that gave us laughs and memories to last a lifetime! The Crystal Rentals team has always been very friendly and helpful, making it easy and stress-free to book our favorite annual trip. Danielle is very helpful. Enjoy working with her. Property is located in a great spot on Platte Lake. You an walk out over 200 yards in the water and not be over your head. Great spot to swim.